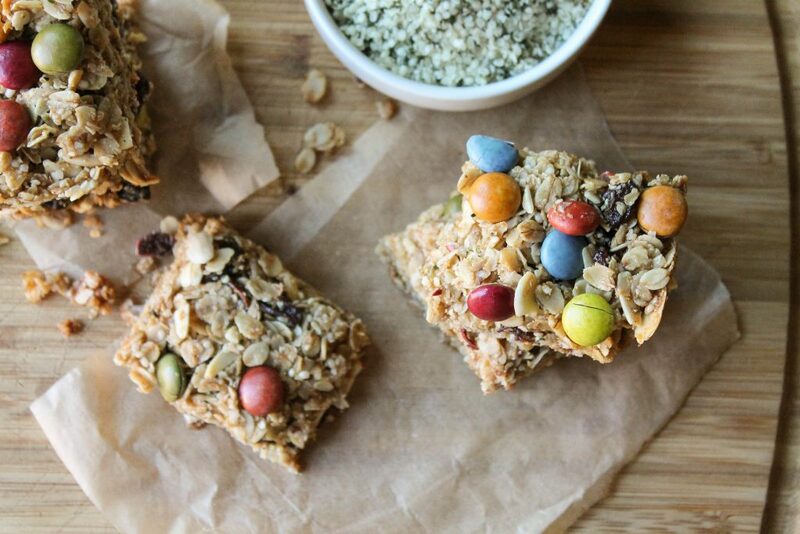 These perfect hemp granola bars are chewy and full of good-for-you ingredients. Making your own granola bars is exceedingly easy, rendering those expensive or loaded with junk store bought ones a thing of the past! Make an after school snack today everyone will love! Hemp seeds and flax meal are great nutritional boosts to these healthy gluten free granola bars. Loads of fiber to help everyone feel satiated longer. I reduced the sugar considerably (while still plenty for us! ), and will sometimes sub Lankanto Monkfruit for the palm sugar to reduce it even further. Either way, the healthy fat from the coconut oil slows the absorption of sugars so giant blood sugar spikes and crashes are avoided. After school snacks are always great to have on hand. If you are like me, you want to try and make something that is kid pleasing, but still loaded with good things for their growing bodies. They are high in fiber to keep you full longer and help with regularity. Research has shown them to be beneficial for lowering blood pressure and raising your good cholesterol! 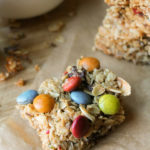 These hemp granola bars will satisfy hunger and and make a great, healthy snack for your family. Don’t forget to personalize your hemp granola bars to your own tastes with the mix ins….lots of options!! dark chocolate chips, or we used the Trader Joe’s “Rainbow Drops” here as an added treat…my kids love the bright (dye free) colors! They have the M & M style or sunflower seed style! Like hemp and want more recipes using them? Here are some you could try! Whether hiking or packing a nutrient dense lunchbox, these hemp granola bars are sure to be a hit! Preheat oven to 350 degrees, and line a 7" x 11' or 8" x 8" pan with parchment. In a bowl, whisk the dry ingredients. In a small saucepan over medium low heat, gently melt the coconut oil, honey, and palm sugar together to dissolve sugar. Mix in the vanilla and sea salt. Pour the wet mixture into the dry ingredients and stir to moisten well. Mix in any favorite add ins at this point. Press the mixture evenly into the parchment lined pan. Bake in a preheated oven for 20-25 minutes until just turning golden. Yummm… it looks delicious! But I think I might add a little cacao power. Thanks for sharing! definitely Kimberly!! Add it in in two ways….with the dry ingredients…or since the liquid mixture is warm, it melts the chocolate chips (or unsweetened chocolate if sugar is an issue) and could be added into the liquid mixture to melt first, so that would work too!! Great idea! 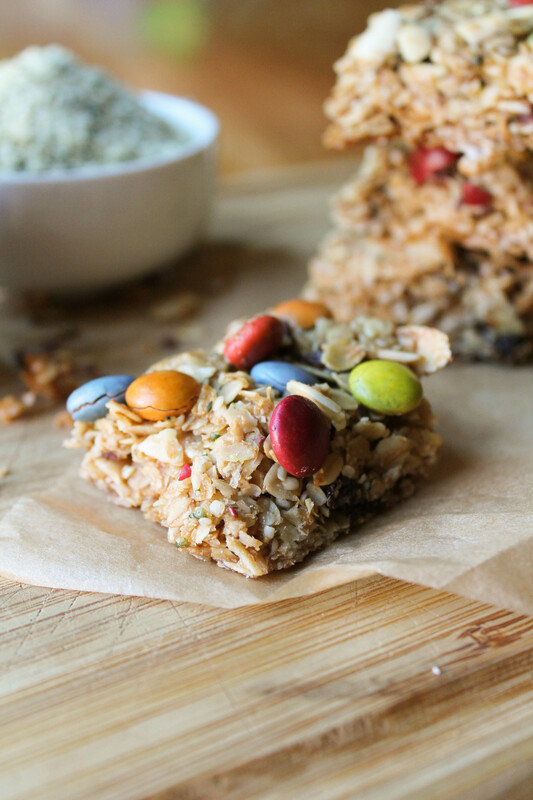 I am so excited to try these hemp granola bars! I have a whole bag of hemp hearts that I just bought and have been looking for delicious inspiration – thank you! I used to add hemp seeds in to smoothies only and never tried to make bars with them. brilliant idea! I wish I had one of these to munch on right now! I need to pick up more flax so I can try it! I love all the mix-in ideas!! So many different ways to switch these up! They look delicious!! I’m sure my kids would love these! They look delicious. It’s great to see both hemp and flax included in these granola bars. What a great snack for the kids to come home to! 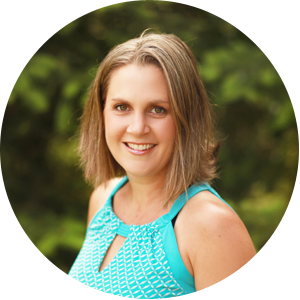 linda spiker recently posted…Vegan Jamaican Jerk Chili with Mango Salsa! These are so pretty, just classic-looking! I know my kids will love them! We’re always excited for egg-free treats! Man, I’m a sucker for chocolate candy in a granola bar! YUM! These look beyond amazing! I have all of these ingredients and will make ASAP! Love hemp seeds as well and this looks like the perfect snack!